Chiropractic care for athletes has become much more prominent in recent years. As chiropractic has developed more and more athletic departments and sports organizations have realized that chiropractic care can benefit their athletes. Chiropractic care is an excellent addition to any sports care treatment program. Through spinal and extremity adjustments, physical therapy, exercise programs and dietary and nutritional counseling; athletes can experience increased performance and reduced risk of injury. Chiropractic care can help to improve range of motion, flexibility, balance, coordination, joint proprioception, body symmetry and agility which are all critical to peak athletic performance. Chiropractic care is a great way to treat acute and chronic injuries but one of the greatest benefits is that chiropractic can help to prevent future injuries when regular care is received. Chiropractic care concentrates on the causes of the injuries rather than only the symptoms. Simply relieving pain is not enough when it comes to sports injuries. Chiropractic treatment helps athletes to recover from injuries much more quickly than other methods of care, and also helps to minimize the risk of future injuries. 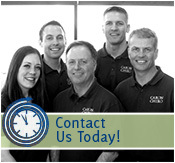 At Caron Chiropractic we treat all types of sports injuries and we help you to minimize the risk of getting one. If you or a loved one is suffering from any kind of sports related injury, please schedule an appointment today.